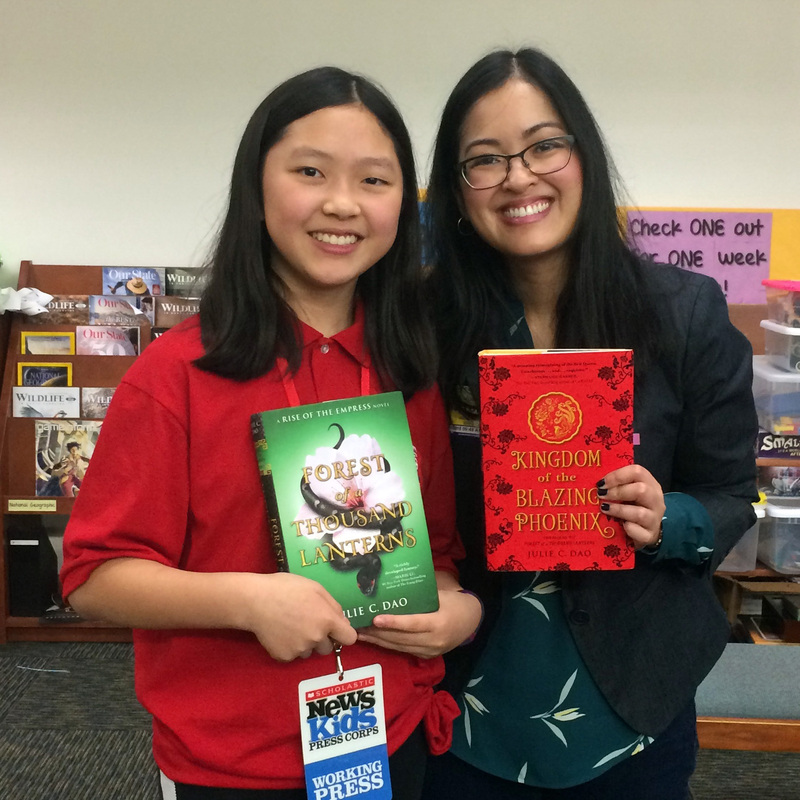 From Idea to Bookshelf | Kid Reporters' Notebook | Scholastic Inc.
Teresa gets writing tips from author Julie C. Dao at Smith Middle School in Chapel Hill, North Carolina. Julie C. Dao made her literary debut with Forest of a Thousand Lanterns (Philomel Books, 2017). The fantasy novel for young people, which is the first of a two-part series, tells the story of an 18-year-old peasant girl in ancient Asia named Xifeng. Her destiny is to become Empress of Feng Lu, but at a great price. Dao, who lives in New England, is Vietnamese-American. She recently spoke about her writing career with students at Smith Middle School in Chapel Hill, North Carolina. Dao explained that she “word-vomited” the first draft of her novel into an online document. The draft was 350 pages long before she revised it. Dao advised writing a synopsis—or summary—before starting on a book. She then makes a chapter online, which helps her with the first draft. “Be sure to get eyeballs on it, too,” Dao suggested. When working on a book, it’s important to get advice from others on what does and doesn’t work. Dao then explained the process of publication. After much effort, she found a literary agent who was willing to represent the book. The agent connected her with an editor at a publishing house. Both agent and editor made suggestions for revising the novel before it was ready for publication. Where do you get inspiration for your books? My inspiration always comes from fairy tales, which I loved as a little girl. For Forest of a Thousand Lanterns, I decided to do a retelling of Snow White. Snow White was never my favorite princess. I wanted to change her character in a way that I would like to see her. I also set the novel in an Asian fantasy world because I wanted to have more characters who look like me. I started when I was 8 or 9 years old because I loved reading so much. I loved being able to fall through the pages into a magical world. I thought, “Hey, maybe I could do this, too,” and wrote my first book when I was 9. What was the biggest challenge on your road to publication? I had a really hard time getting people who were interested in what I had to write, which was about an Asian heroine. It was hard finding someone to represent me [an agent]. I think it took about seven or eight years. It was the longest part of my journey. Once that started, things began to snowball. No matter where a writer is on their journey, if there’s a hard time, they should know that they should keep going and, hopefully, it will be a little bit easier in the future. Why did you choose fantasy? I love fantasy. It’s the one genre I read a lot. I wanted to write it myself. I just love being able to escape. It feels like walking through a door and closing it behind you, and you’re in Narnia, Hogwarts, or Middle-earth from Lord of the Rings. I’ve always liked being able to go off somewhere by myself and explore. That was the mindset I brought to reading books. With writing, I like to joke that you’re the god of your own little world, and you get to decide what happens to everyone. You have a lot of power, and it’s fun. It’s just fun. I can’t not write. It’s something that I’ve always done because it takes stress away from me. I feel like I’m relieving my stress and escaping from the world when I sit down with my own characters. I’ve always wanted to have people who would read my books and find in them a good story. It’s very rewarding to have readers. What is your advice for future authors out there? Keep writing and reading as much as you can. The only reason that I got better at writing and finally got published is that I wrote a lot. I don’t think anyone is born a good writer. People are born liking to write a lot. Because they like it, they want to work on it. When you like something, you want to spend a lot more time on it. The more time you spend on it, the better you get. Writing as much as you can is super important. Kingdom of the Blazing Phoenix, the second book in Dao’s fantasy series, was released in November.